The EMS book club posing in front of the Washburn University logo! 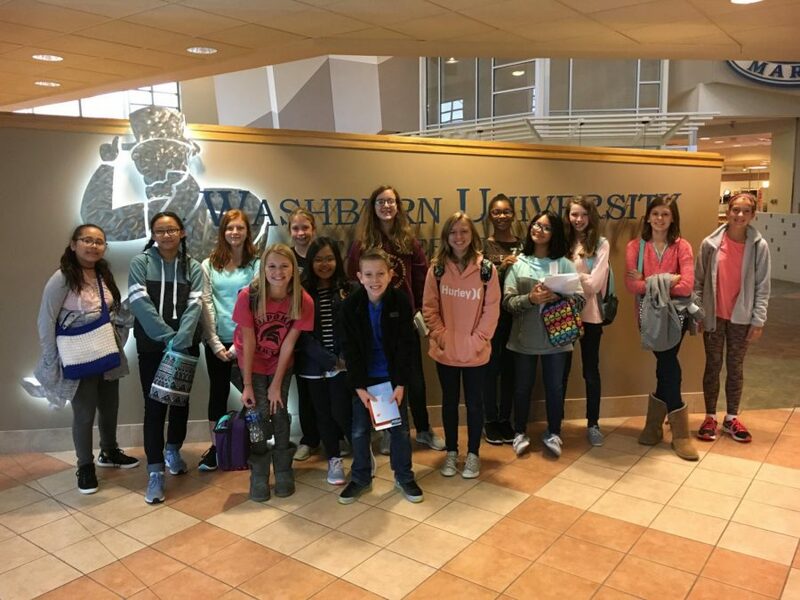 Tuesday, October 10th, 2017, the Emporia Middle School book club took a trip to Washburn University in Topeka, Kansas. I am a member of the book club that had recently taken the trip. This will be about my experience in Topeka and meeting Sharon Draper. Sharon Draper is the author of Copper Sun and many more books I would definitely read or recommend. Tuesday morning, I woke up like I usually did. I had my lunch and bag of necessaries ready. I arrived at EMS and five minutes later my friend Chloe came in. Chloe and I went to the library and sat with the club. We waited ten minutes and Mrs. Ovsak, the librarian and leader of the book club, led us to the front of the school. Seven people, including me, crowded into a van. Our driver asked if we were all there by doing attendance. The other group members went on a different van. I was in the back and on my left, was my friend Chloe and on my right was my other friend, Lenia. The drive to Topeka wasn’t long, so it wasn’t a surprise that we had already arrived only an hour later. We arrived at Washburn University and I stepped out of the van, exhilarated I could stretch my legs. The book club group gathered and Mrs. Ovsak lead us into the university with the help of Mrs. Reed (a ESU worker and one of the leaders of the book club). My friends and I walked into the huge, fancy university. It was finally time to go to the whole group session with Sharon Draper. As a whole group, we headed to a big room with people already in it. The session had already started but we didn’t miss Sharon Draper. In fact, we were in time. A man stood and talked for awhile and then said, “Now to speak with you, author Sharon M. Draper!” There was a cheering and Sharon Draper came out to the stage. Sharon Draper described her time writing Copper Sun, Stella by Starlight, and Out of My Mind. A fact I learned was that it took an entire 10 years of writing and publishing Copper Sun! She talked about how it wasn’t easy to write and it took time. She gave great advice for aspiring authors. After the Q&A, the book club had to split up and go to different events. Half of the group had read Copper Sun, the other half had read Stella By Starlight. Mrs. Ovsak leads the Copper Sun group to our next event. During the session, they gave us coloring sheets and we talked about major events in the book. After an hour or so of the whole group talking, we had to unfortunately go. Mrs. Ovsak decided for us to have lunch with the Stella by Starlight group and we sat in the fancy cafeteria. I sat with my friends at a big round table. We had a fun time messing around and enjoying ourselves. I went to the cafeteria to buy some chips and a smoothie. Five minutes later, my friends wanted some food so I bought them a pack of chips. We finished our snacks and it was time to go. Mrs. Ovsak leads the Copper Sun group to the private Q&A with Sharon Draper. During this specific session, we talked all about Copper Sun. The hour flew by, and we waited for the next session to begin. My group and I came back in shortly after because it was too cold to be out there for a long period of time. My friends and I took a front row seat and we waited for Sharon Draper to come out once more. An hour later, my group exited the second Q&A section. We had a free period of time so we went to the Washburn University food shop. I bought a Snickers and a bag of Twizzlers (as if I haven’t had enough sugar already!) I sat with my friend Chloe and we played on our phones and talked to the others until it was time for the book signing. My group got in the line first and about ten minutes later, the Stella by Starlight group came. Unfortunately for them, they had to go to the back of the line and had to wait for more than thirty minutes! Meanwhile, I got my book signed and a free bookmark. Sharon Draper said thanks for coming and have a nice day. I went to sit down and wait for the others to get their books signed too. The wait was long but I got to play outside, despite the freezing cold. A boy in my group thought it was a good idea to climb on the big bell statue on the university campus and take pictures. We had a good time running and messing around until Mrs. Ovsak called us back inside. The Stella by Starlight group finished getting their books signed. We all decided to take one last group photo next to the Washburn University sign and then head back to Emporia. After a few quick pictures, Mrs. Ovsak led the book club out the doors and we walked to the buses that were going back to Emporia. Arriving back at EMS a short hour later, it was time to go home and I left my friends. My mom came and picked me up and I told her about the trip. I had a good time hanging out with my friends and meeting Sharon Draper. If you are the type of person who loves to read, this Emporia Middle School’s book club is something you would enjoy! If you joined, you’d be able to read amazing books and go on cool trips like the previous one! Also, you get to meet authors and go behind the scenes, something any book reader would love.